← Champagne – the return of the pint? It was the author – Agatha Christie – and title that got me. 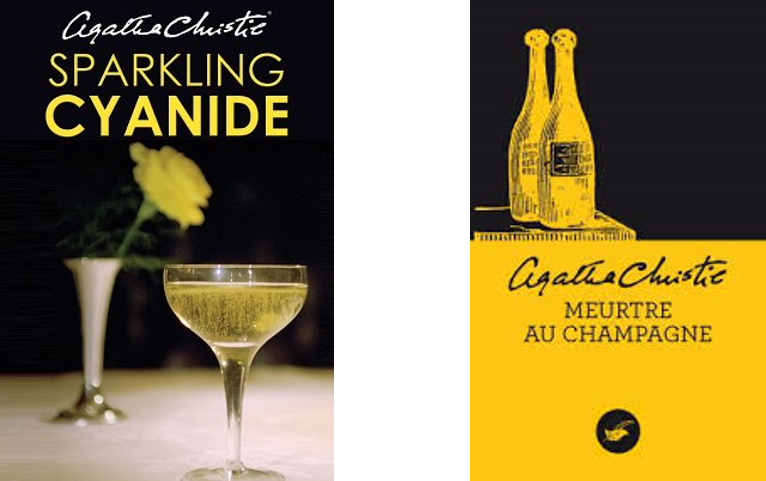 Translated back into English that’s ‘Murder by Champagne’ and it took a moment to work out that this must be the novel that Christie published in 1945 – ‘Sparkling Cyanide’. It turns out that this novel – set in an upmarket restaurant in London – was an expansion of a short story of 1937 called ‘The Yellow Iris’, also billed that year as the first play that Christie wrote specifically for the radio. For the novel Christie changed not only the detective (from Hercule Poirot to Colonel Race) but also the country of the setting and the identity of the killer. Only the victims, the modus operandi, the cyanide and the champagne survive from the original. But what a champagne! Christie specifies Veuve Clicquot 1928, one of the three greatest champagne vintages between 1918 and 1939 (the other two were 1921 and 1937). Understandably, opinion on the precise taste of cyanide salts differs. Few people have made the experiment and found time to record their observations but the consensus is that there would be an immediate burning sensation in the mouth and the taste of either bitter almonds or ‘nut-honey’. Nor can we be sure that the (probably sweetish) taste of the wine would have masked the poison. When the real-life assassins of Gregori Rasputin gave him cyanide in December 1916 to rid the Russian Court of his influence Tsar Nicholas II it was laced into glasses of Tokay. However, Christie drew on her own pharmacological knowledge so I’m prepared to give her the benefit of the doubt. At the time the story was written Veuve Clicquot 1928 was around 15-16 shillings per bottle (75-80 pence) at retail, undoubtedly more in a posh London restaurant with a four or five times mark up. Fifteen shillings was the weekly rent of a two room flat or the weekly wages of a laundry-woman. £4 was the weekly wage of a Health Visitor or junior town planner. Clicquot 1928 was undoubtedly a superb wine. Michael Broadbent’s irreplaceable ‘vintage Wine’ (Little Brown, 2002) records tasting it in 1997. He called it a ‘beauty’ with ‘rich old flavour and considerable depth, sweet, rich, assertive, good length’. Another bottle tasted the following year had lost its sparkle so he cut it 50-50 with a bottle of young non-vintage wine. This entry was posted in Uncategorized and tagged champagne, Tokay, vintage. Bookmark the permalink.